The Gregory's Tree Cairn is situated on the Victoria Highway at the entrance of the road which leads to Gregory's Tree Reserve. It gives details of Augustus Gregory's expedition of 1855 - 1856. Gregory`s Tree has historical and social significance as it is a living monument to the exploration of the North of Australia, in particular the North Australia Expedition led Gregory in 1855-56. In 1855 the explorer Augustus C. Gregory, who was financially backed by the Colonial Office to explore the area, sailed from Moreton Bay around the coast of Queensland and the Northern Territory and up the estuary of the Victoria River. Gregory`s boat was wrecked at the site of Timber Creek. It is claimed that Gregory named the site Timber Creek after he had cut some timber to repair the hole in his vessel. 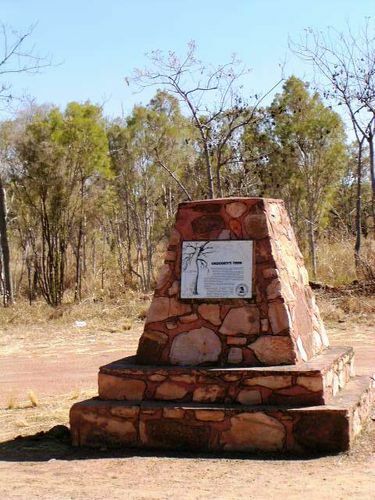 The boab tree marks the area of Gregory`s 'entrenchment camp' from October 1855 to July 1856, and still bears inscriptions noting the date of arrival and departure from the camp. On July 2, 1856 Gregory left an inscription on the tree (so-called Gregory's Tree), indicating where he left a letter in case the expedition team should get lost. Turning east, the party explored the Elsey, Roper and Macarthur Rivers, then travelled back to Brisbane by way of the Flinders, Burdekin, Fitzroy and Burnett Rivers. They reached Brisbane on 16 December 1856.